Sometimes the things we forget are the reflections worth remembering. It is really the smell that hits you first, a mixture of stale fish sticks and Clorox, before the din of a hundred middle schoolers who are hopped up on caffeine and sugar make their way out of the slightly ajar double doors. The long tables are crowded with bobbing heads and flailing arms as Lunchable desserts are traded for leftover pizza amid a chorus of clattering plastic chairs and scraping table legs. My grey Converse tennis shoes make a sticky sucking sound as I wind through the cafeteria, stepping over stray backpacks and looking across the heads of rowdy tables of boys and chatty cliques of girls, searching for our table. My table. A few months earlier, as a transfer student in a new school, these steps were the most terrifying ones, looking for friendly faces among the unfamiliar ones. There is something universally unsettling, among students and adults alike, about walking alone into a crowded room. Even these days, with a secure friend group, it is not an experience I relish. I am also painfully aware that I have packed hummus, garlicky hummus, in my bag. But as any middle schooler knows, it’s less about what you eat than where you sit and with whom, which isn’t to say that packaging, the cellophane wrappers of the latest grab-and-go snack food or the innocuous brown bag and insulated lunchbox, is not full of meaning in its own right. Embedded in these twenty-five minutes of rushed chatter among peers are some of the most important lessons students can learn in school and in life. 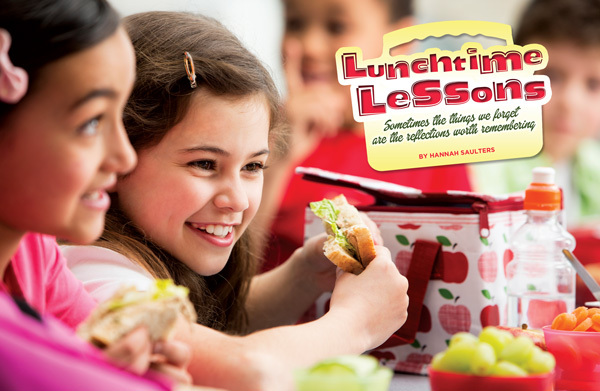 Tenets of inclusivity, wellness, and socialization all characterize this ritual of lunchtime. One of the first lessons eating in a lunchroom will teach you is the importance of chewing with your mouth closed. In the literal sense, it is just good manners. No one cares to see the half-eaten bite of peanut butter sandwich in your mouth, and it’s impossible to understand what you are saying anyway. Beyond the social necessity, though, around the lunch table, you learn what it means to pause, to listen, to process. It is a time to learn to be respectful of others’ opinions. Chewing with your mouth closed, so to speak, gives you time to reflect on how you feel, and formulate your own opinions, before responding to the words of others. Another thing to learn at lunch and in life is that, if you try hard enough, there is always room for one more chair around the table. Being in middle school and finding friends is hard work. It is intimidating. Oftentimes that fear manifests as exclusivity. As a veteran of pushing more tables together, perching on armrests, and sharing seats with friends, I can attest that the extra effort to include the shy girl from your history class or the awkward boy who sits behind you in biology is worth it for your sake as well as theirs. At first glance, it seems like you can tell a lot about a person based on what and how they pack for lunch. Do they go through the hot line? 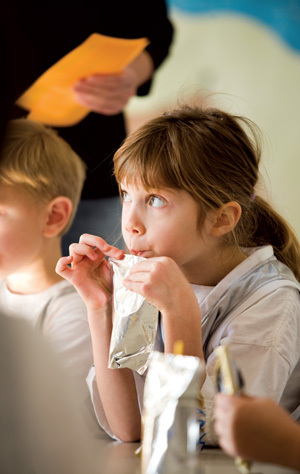 Do they bring their lunch in paper bags or insulated lunch boxes? Are they eating something packaged or something their mom put together? As teenagers, we look for identifying characteristics of our peers that make it easy to categorize one another. But when you peel that packaging away, what you are really left with is food. There is something profound about people of all ages gathering and eating. Relationships are forged sharing food and friendship, no matter what kind of container it comes in. It has been quite some time now since I have eaten lunch with those people in that place. Years have gone by without worrying who will sit where or whether or not I should pack this tuna salad. But I suspect that the interactions within school cafeterias have remained similar. I hope so. Lunch is one of the last times that preteens and adolescents are given permission to play, to be silly. 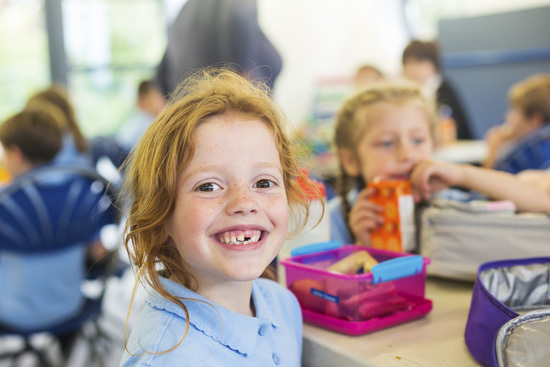 It is a period of transition not just from morning classes to afternoon ones; the lunch period is a microcosm of growing up, full of “nutritious” lessons along the way. with editorials and advertising requests.